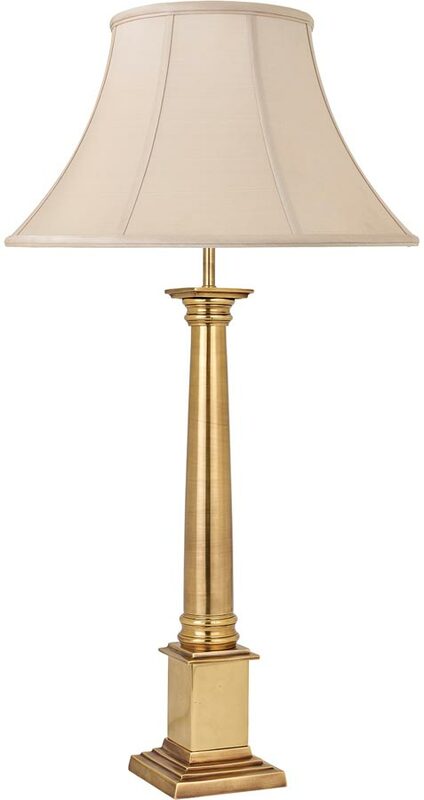 The Nelson Traditional solid brass column large table lamp base, crafted entirely by hand from solid brass and hand finished in a mellow natural brass. A stunning high quality column table lamp base, with a square stepped plinth, circular column stem and square top platform. Fitted with an inline cable switch. Shown here fitted with a tapered, 18-inch oyster silk lamp shade but supplied as base only. The shade can be purchased separately by following this link. Please note that the dimensions shown in the technical information are for the base only. Height with shade as shown 86.5cm. Please see additional image of the base only. This table lamp base has been lacquered to ensure that the finish lasts without polishing. It is important not to use any abrasive or chemical cleaners as this will damage the finish. A light dusting or cleaning with a damp cloth is all that is required to maintain its good looks. 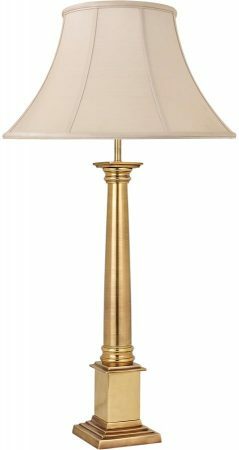 The Nelson Traditional solid brass column large table lamp base, part of the Rochamp collection of solid cast brass light fittings. Made entirely by hand using traditional sand casting techniques passed down through generations. The parts are then polished before being patinated to give an aged look.